John Fraser (who isn’t Scottish) was born in Finchley, North London, in 1928. His Cornish mother, a former office worker, loved movies and theatre-going, encouraged his childhood creativity, and had a strong sense of style and an eager curiosity about personalities and trends in the news. She left the family when he was thirteen, and died tragically twelve years later. He was a boarder at a country grammar school during the War, won a scholarship to Balliol College, Oxford, did his two years of postwar military service as a clerk in the R.A.F., received his B.A. in 1951, and taught English—very badly indeed—in an Israeli high school for the next two years. Thanks to the friendship of Mike and Norma Zwerin, he was able to emigrate to America, where in 1961 he received a Ph.D. in English at the University of Minnesota, with a Philosophy minor. He and Carol Hoorn met there, and were married in 1956. In 1961 they moved to Halifax, where he taught at Dalhousie University until his retirement in 1993 as George Munro Professor of English. 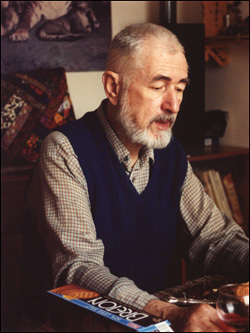 During his time there he published Violence in the Arts (1974), America and the Patterns of Chivalry (1982), and The Name of Action: Selected Essays (1985), all with Cambridge University Press, plus numerous other articles. In 1990 he gave the prestigious Alexander Lectures at the University of Toronto. His long article in the Cambridge Quarterly (1968) on Eugène Atget was reprinted in Studio International and in the two-volume anthology The Camera Viewed; Writings on Twentieth-Century Photography (1979). Ten of his recently self-published little Throwaway Books of his photographs are in the archives of the Minneapolis Institute of Arts. Some of his professional writings are in the other wing of this site.